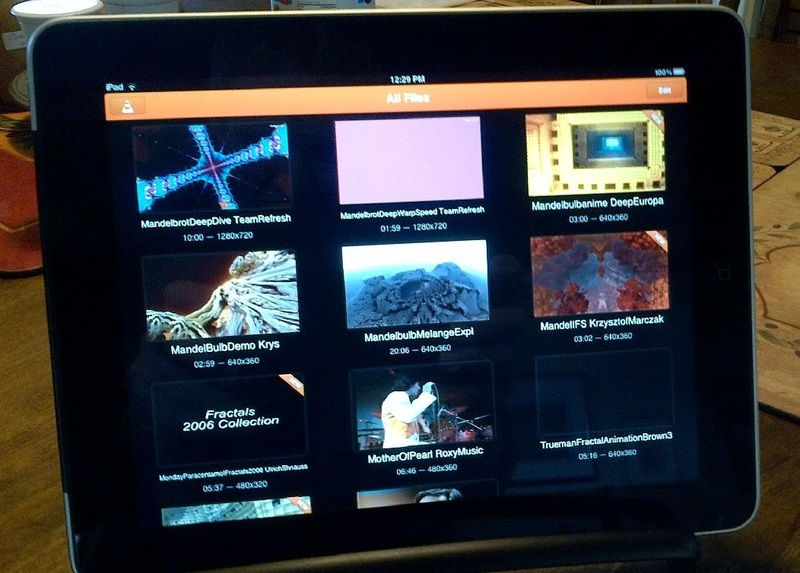 This page provides a brief summary on how to get the VLC package running on a jailbroken iPad, running verison 5.1.1 of iOS. 2) You have to put the vlc-iOS-2.1.3.ipa file into the /var/mobile/Downloads directory on your jailbroken iPad. 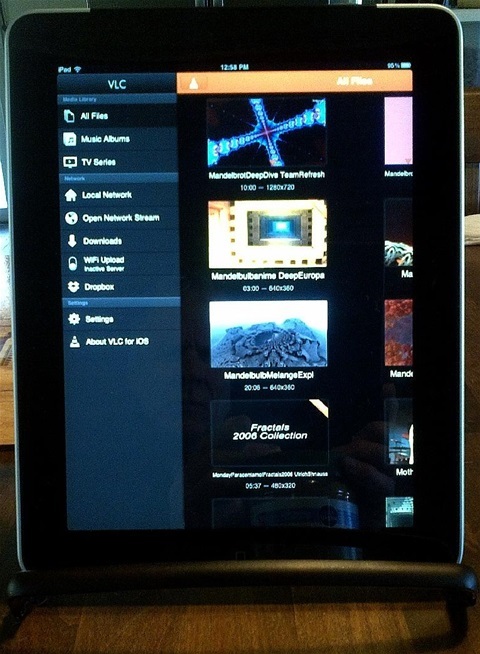 I used "scp", the secure copy program that you can use to access your iPad, after it is jailbroken, and made available on a local-network. 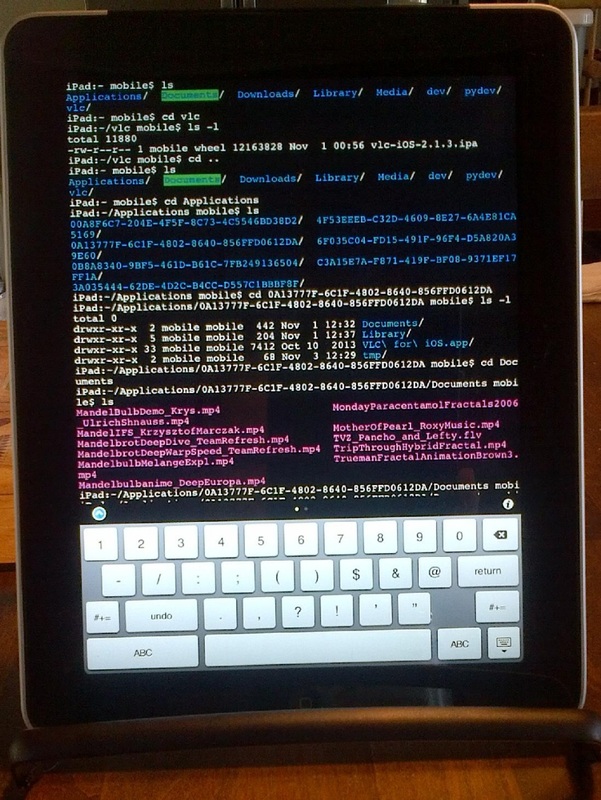 One typically uses "putty" on Windows, or "ssh" on a Linux box, to shell into the iPad over a wifi link. You can get OpenSSH from Cydia repo Telesphoreo. If you have configured your Safari browser on the iPad, so it can do downloads, you can also download the .IPA file. But here is the trick: The Safari downloaded material is not placed in "/var/mobile/Downloads" (where it should be), but instead, ends up in "/var/tmp/SDECache". But that is ok. Just fire up "Terminal", and copy the file over to the /var/mobile/Downloads directory, and the Install0us installer will find the file ok. Note also: to get the Safari downloader stuff working on iOS 5.1.1, you will need to install *two* apps from Cydia - the "Safari Download Manager", from Cydia repo Insanelyi, and the "Safari Download Enabler", from Cydia repo BigBoss. Note that your downloads will all be dropped into /var/tmp/SDECache. But they will be there, and should be ok. Just use "cp" or "mv" in terminal to put them where you want them to be. 3) Get the "Install0us" app from Byte Your Apple (BYA) repository on Cydia. You will use it to install the .IPA file. 4) Start up a "Terminal" session and make sure it is there. I first created an archive directory called "vlc" in "/var/mobile", just to keep a copy of the original .IPA file on the iPad, in case the install did not work. You can use standard "cp" unix commands to copy files around in your /var/mobile area, and "mkdir" to create directories. 5) Once you have downloaded "Install0us", click on it and find the vlc-iOS-2.1.3.ipa file that you put into /var/mobile/Downloads. You will have to click on "Downloads" at bottom of Installous screen. Click on the filename to install VLC. This will create a directory called "/var/mobile/Applications/<big-long-hashstring-of-hex>/", where VLC will be installed. 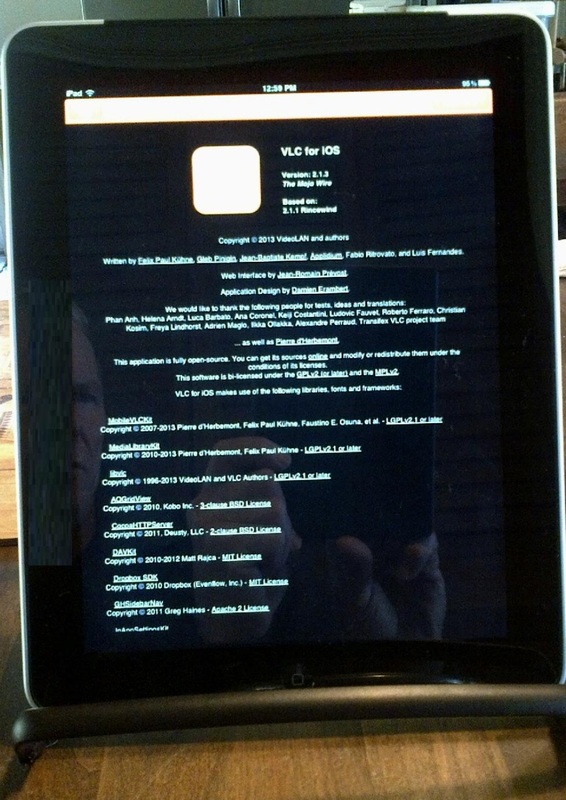 You should see the VLC icon on the iPad screen, and it should work. Note, if you are like me, and do not use iTunes, you will need to copy your videos and movies into the "/var/mobile/Applications/<big-long-hash-string-of-hex>/Documents" directory, so that VLC can actually find your video files. The "/var/mobile/Applications" directory has each application under a generated <big-long-hash-string-of-hex>, to facilitate Apple's idea of the "Sandbox", which is great if your are giving the iPad to a child to play with, but damned annoying if you want to use the device as a computer, which it of course is. Here is a trick: Configure your "Terminal" app to use swipe up and swipe down gestures to generate up-arrow and down-arrow. That way, you only will a have to type the <big-long-hash-string-of-text> that identifies the VLC application directory once. When you restart "Terminal", just swipe-up to see and use all your old commands that you entered before. 6) Use the iFile app, or just use "cp" and the "Terminal" app, to migrate your movies and video files into VLC's "Documents" directory of the VLC-applications-sandbox directory. See the photo called "Where the Files Are" for an on-screen explanation. If you are confused by all this, find someone who knows a bit of unix/Linux, and get them to explain some basic features and commands. 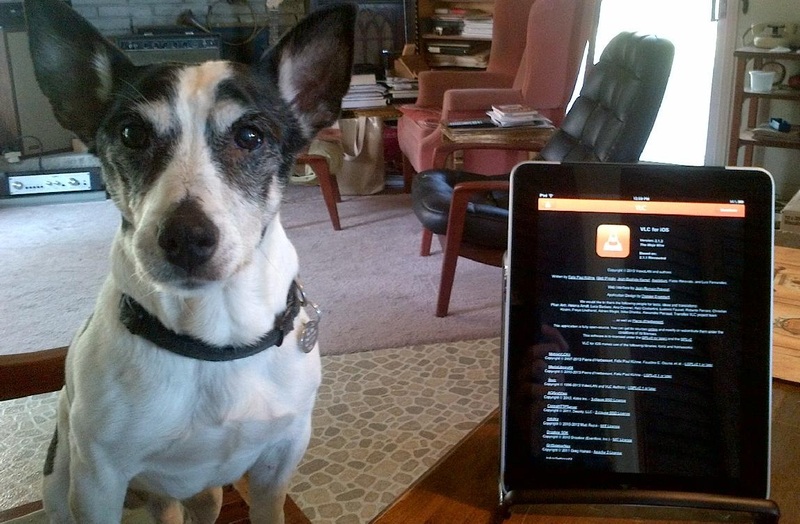 VLC 2.1.3 on iPad-1, running iOS 5.1.1 is Taro-approved. You will need Install0us, from Cydia repo "ByteYourApple". Once you have the VLC .IPA file in /var/mobile/Downloads, click on Install0us icon, then click "Downloads" at bottom of screen, and you should see the vlc-iOS-2.1.3 filename to install. Terminal session, showing where VLC files are placed, after the install. Copy some video files into "/var/mobile/Applications/<VLC's_sandbox_directory>/Documents", click on VLC icon, press the cone-icon screen top-left, then press "All Files", and you should see thumbnails for your videos, similar to above screen. Example of .mp4 and .flv files in VLC's sandbox ../Documents directory, available for iPad viewing. The .flv files are Adobe Flash Video files, which VLC can play successfully on the iPad. Ghosts in the Machine. These folks created VLC. Maybe send them a donation, if you enjoy watching videos on the iPad. VLC 2.1.3 on the iPad running iOS 5.1.1 is Taro-approved.